The front yard tower kestrels nested as usual this year. The tower nest box wasn’t checked, but the adults were bringing prey to the box and at least 4 fledglings were observed being fed on the telephone wires. 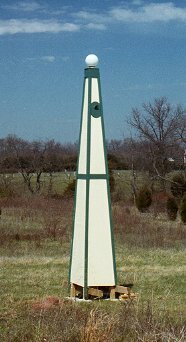 In earlier years, the kestrel tower was in view from our front porch where, in spring and summer, most of our meals are consumed. But, now, a white oak in our front yard, grown from a cutting of the famous “Wye Oak” has grown to obliterate our mealtime view of the kestrel tower. But, I did notice that while the kestrels were nesting, a pair of starlings were also entering a hole above the flicker box on the side of the tower and appeared to successfully nest there. A flicker had made this hole in a previous year. I must pay more attention to the goings on in the front yard. 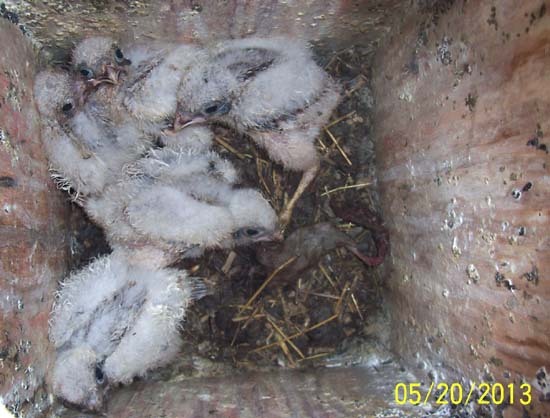 Since a second pair of kestrels successfully nested in a flicker box mounted on the barn in 2010, kestrels have continued to show an interest in this box. 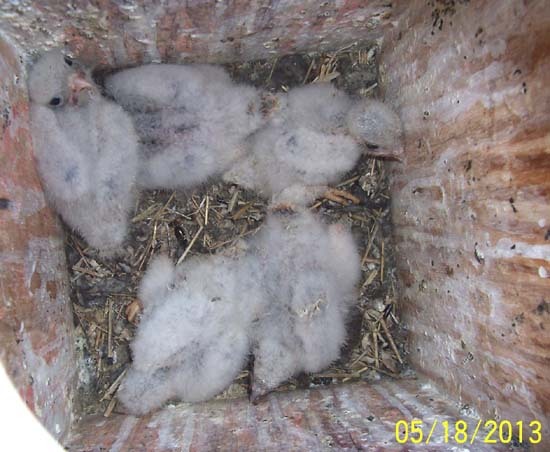 In 2011, a female kestrel frequently entered the nest box, sometimes spending the night. However, a male was not present and no nesting took place in Box A in 2011. But, by fall, she had recruited a mate and the pair were frequently seen in the ugly young maple near the nest box. 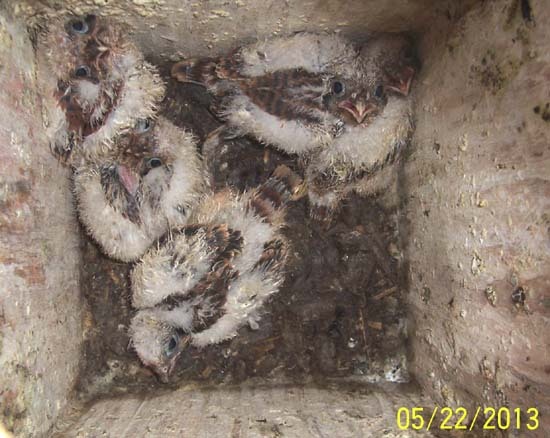 In the spring of 2012, the pair were frequently entering Box A and defending it from starlings and flickers. 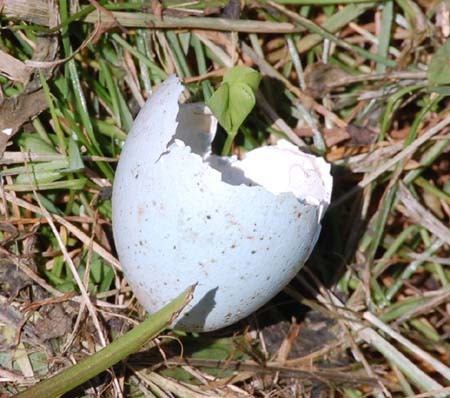 The first kestrel egg appeared on 6/6/2012. On 6/7, a male flicker entered the box at 9:41 and removed the kestrel egg. At 10:05, the female kestrel entered the box and did battle with the flicker. She frequently checked the box for the next few days, often spending the night, but no more eggs were laid. On 6/13, the female kestrel entered the box at 20:33, as usual, to spend the night. 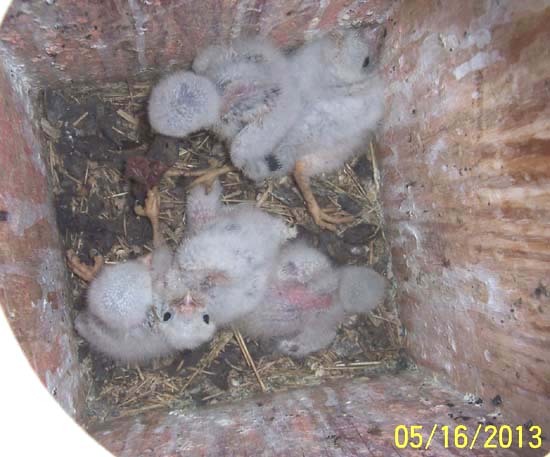 At 20:43, a second female kestrel entered the box. The infrared lighting showed the two kestrels quietly resting side by side with no interaction between them. This may be because the box would have been very dark at this time of day. 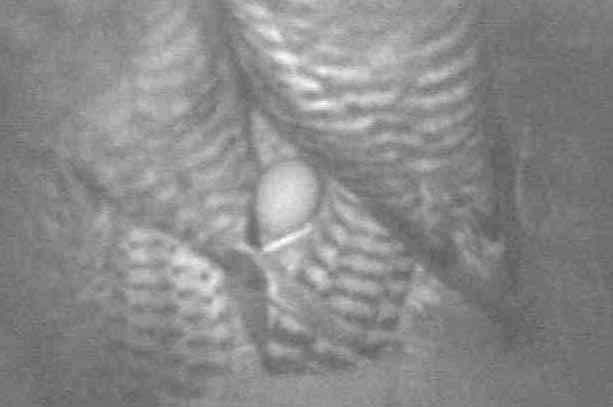 At 21:25, the second female kestrel laid an egg. Both birds remained in the box until morning. The first kestrel left the box at 5:25 and the second at 5:34. Two females were never seen together again and no more eggs were laid, even though the pair still frequently visited the box. The pair are still seen in the ugly young maple tree early each morning and again in the evening and are roosting under the eaves of the barn most nights. As in 2010, when both pairs of kestrels nested simultaneously, they seem to have agreed on splitting our 17 acres in half. The tower nesting was unmonitored this year, except for observing the adults taking prey to the tower and later, feeding fledglings on the power line along the lane. When the nesting was completed, the tower was partially dismantled and new siding installed. The camera was cleaned and tested and a new remote thermometer installed. 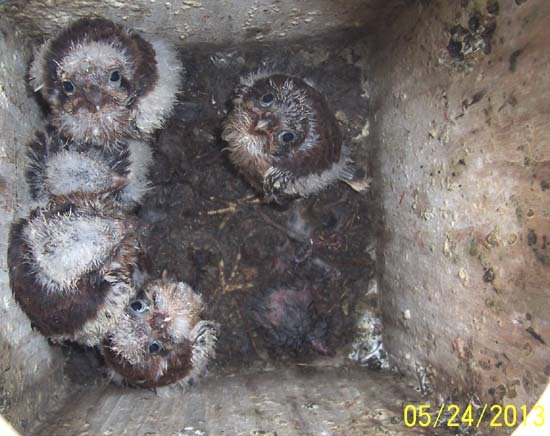 Several years ago, a flicker had excavated a hole in the tower above the kestrel nest box and starlings had been nesting there every year since. 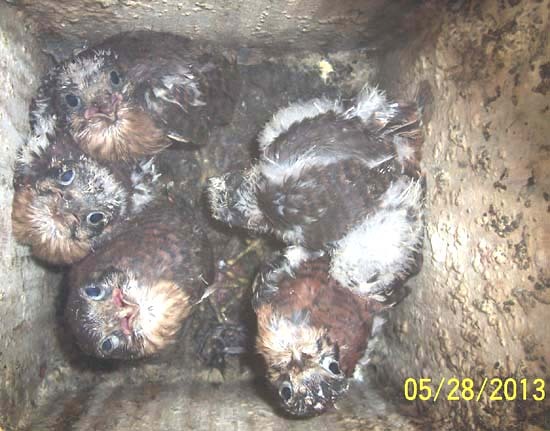 The second pair of kestrels have again nested in flicker box "A" mounted inside the barn wall. 5 eggs were laid and all young fledged. As in previous years when both kestrel pairs nested simultaneously, I observed no interactions between them. The barn pair hunt north of the barn, along the creek while the tower pair hunt in the front field and along the power lines. The closest the tower pair come to the immediate yard is to perch on the power line at the edge of the front yard. The closest the Box "A" pair come is the rear of the barn, usually perching in the ugly young maple. This is lucky for the purple martins, who nest in the middle of the yard, between the house and barn. 2014 American Kestrel nesting - This year two pairs of kestrels again initiated nesting. However, this resulted in only one successful fledge. The tower pair nested rather early, as usual. A small video monitor was left in the instrument compartment to check the nesting progress, but no recording was done and I seldom checked the monitor. On two occasions, the female was observed brooding young or sitting beside 4 or 5 young nestlings in the box. From the outside, the male was observed bringing prey as usual. However, it later became apparent that the kestrels were no longer present and starlings were entering the tower. It appears that one of the adults had died, causing the other to desert the nest. The same day I noticed their absence, I found a dead barn swallow along the highway beside our mail box. There is no connection, of course, but that reminded me that both species are subject to roadkill because of their hunting methods. The kestrels use the powerline along the highway as a hunting perch. 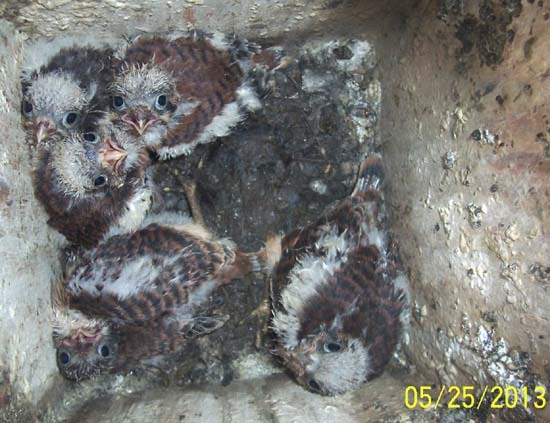 Whatever the reason for the nest failure, kestrels were not observed at the tower again during the nesting season. The second pair of kestrels that have been using a flicker box on the barn wall began the season as usual, with both adults frequently visiting box A. This box is mounted inside the barn wall, making nest checks and photography of the nestlings easy without the adults being aware. However, the female soon became far more interested in box B, which is mounted on the exterior wall. No matter how often the male tried to entice her to enter box A, she eventually laid her first egg in Box B on April 23. 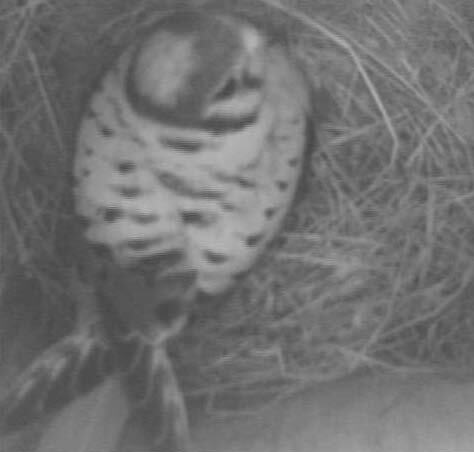 This is likely a new female, since the kestrels had previously successfully nested in box A. Five eggs were laid, and the nesting seemed to progress normally. 4 of the 5 eggs hatched between 5/27-5/28. However, by 5/30, only a single nestling was still alive. The female tended the young normally and the weather was not a factor. The single nestling seemed a bit precocious, but fledged right on time on June 30. Box A was left vacant, allowing flickers and starlings to continually compete for a nest site. The starlings continually drove off the flickers and I continually trapped new pairs of starlings until they finally lost the urge to reproduce. 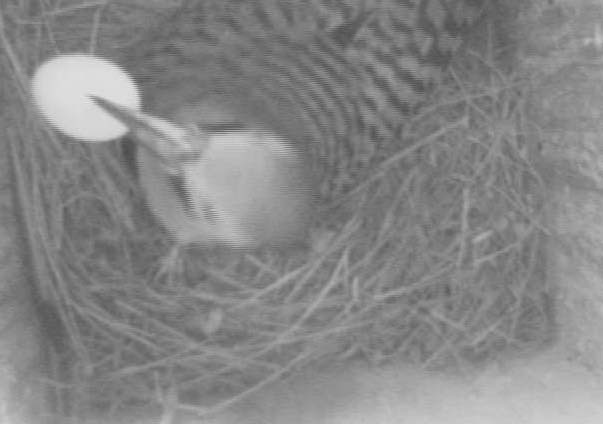 On June 7, the first flicker egg was laid. They successfully fledged 4 young. Flickers, kestrels and barn owls were all simultaneously nesting in boxes on the same barn wall. 2015 kestrel nesting This year 3 eggs were laid in the tower nest, but the nest was soon abandoned. Starlings immediately began visiting on May 8, but were not likely the cause of the kestrel's desertion. 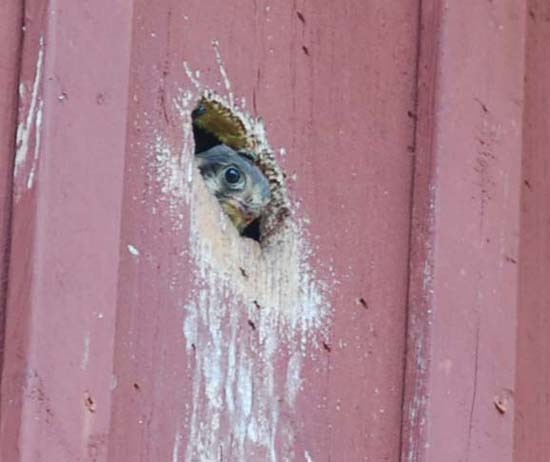 Box A on the barn was used by the second pair and 5 young fledged without incident. 2016 kestrel nesting Both the tower and the barn kestrels successfully fledged 5 young each. &COPY; 2015, American Artifacts and Richard Van Vleck, Taneytown, Maryland.